Blagdon have developed a superb range of LED garden and underwater lights for outdoor & submersible pond illumination and decorative effects. Specifically designed for safe, low-voltage underwater or surface illumination, Blagdon LED Pond Lights are built to last whatever the weather and include a full 3 year guarantee. Illuminating your pond or watercourse not only increases its attractiveness, it also ensures safety, as it is easier to see in the dark. Coloured lenses can give an extra dimension to your lighting effects. 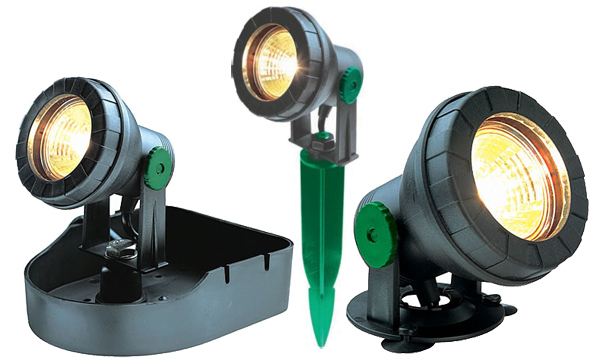 Powerful LED lights for garden or underwater use, the Blagdon Enhance LED Pond Lighting utilizes a unique 12 volt underwater transformer that enables bridging long distances between the 230 volt mains supply and the transformer with standard cables. A 360 degree mounting bracket provides precise alignment and each light is also supplied with a stake in addition to the mounting bracket. The Blagdon Enhance LED Pond Lighting is a revolutionary low-voltage light range for creating beautiful lighting effects in either the pond or garden. Complete with weatherproof transformer, the Blagdon Enhance LED Pond Lighting sets offer unrivalled flexibility of installation. Supplied with 3 colour lenses for changing the lighting effect. Installation range for 3 light set: 3m from plug to the transformer, 7.5m to a manifold which has the 3 lights off it at the end of 2m cable each. Extend your enjoyment of your pond or water feature into the evening with these attractive and versatile lights. For wonderful natural illumination, take a look at our Pond Lighting range. Absolute Koi has lots of offers and a comprehensive range of pond lighting and accessories. We can provide solutions for small garden pond to large koi ponds. With so many possibilities for transforming the garden into a landscape with spectacular water effects and enchantingly clear ponds, one element should not be forgotten: The correct lighting. If you want to illuminate your pond even in the dark, the possibilities are endless. Not all ponds have to be grey by night! We have searched long and hard and have managed to put together a range of professional lighting solutions.